For high school students who wish to advance to university and study liberal arts education, the school of law is probably one of their choices. However, for some reason, the law that students study in the school of law is often thought of as being a rigid and difficult academic discipline. Law is not part of any educational curriculum up through high school, and it may be difficult for high school students to understand. However, the study of law has become systemized, and it is easy to take a high-level view of its overall image; in addition, as with science subjects such as physics and chemistry, the elements that should be studied and the sequence in which they are presented are fixed, for the most part, from the beginning of studies up to a certain stage, as an accumulation of knowledge based on the foundation that one initially learns. In this respect, I believe law is an area that is easy to start studying. Law is applied to nearly all issues that arise in society. For example, it is applied in daily life when you ride a train or bus, when you send a package, and when you purchase a smartphone. It is also applied when you get married or inherit property, and related to various social settings at your company after you graduate from university. Law itself is something that is actually a part of everyone’s life. However, the strengths of those who have graduated from the school of law, or in other words, what is truly useful about studying law is not the fact that your mind becomes filled with legal knowledge. The school of law is not about memorizing the Compedium of Laws. Rather, what is important is the keen sense of fairness and justice that one acquires naturally from learning law, and the ability to think and judge logically. The fact that graduates of the school of law do not pursue only legal professions and are successful as leaders in various areas of society is proof that the skills that they acquire in the school of law are important qualities as leaders. In this sense, studies in the school of law are useful, regardless of what path you choose in the future. Together with other private law schools, Tokyo Senmon Gakko (established in 1882), which was the predecessor of Waseda University, was counted as part of the “Five Major Law Schools.” As other law schools focused on professional education to produce judges and prosecutors, the Tokyo College had carried out education by placing emphasis on human education. Waseda University’s School of Law has actually built its reputation today by producing many superior human resources such as businessmen, public servants and journalists, while also fostering many legal professionals and researchers. Even today, the education that Waseda’s School of Law aims for is to develop “lawyers, in the broad sense of the word,” which means to develop sound citizens who have a broad horizon and deep insight in relation to society, as well as the ability to think and judge unerringly and logically through legal education. Such kinds of citizens are considered to be human resources who are sought after in all areas of society. At Waseda University’s School of Law, many language education courses and legal courses are available, based on the fact that students’ paths are diverse, and well over 1,000 classes are offered every year. From among these many courses, it is possible for students themselves to voluntarily choose the courses they want to take, depending on their interests and the path that they choose. As a guide for choosing classes, we have prepared the Course Model for law classes. In addition, to be able for everyone who is new to law to start their studies smoothly, the School places particular focus on enhancing introductory education, such as introductory lectures and introductory seminars. Furthermore, a major characteristic of the School is the fact that there are many language education courses offered that are positioned as the foundation for studying law classes. As an extension of language education from the time of students’ enrollment, opportunities are provided for students to broaden their horizon and world while studying law classes; for example, minor programs centering on regional research are offered. Recently, the University is moving forward with establishing new classes to adapt to globalization of society and diffusion of IT. 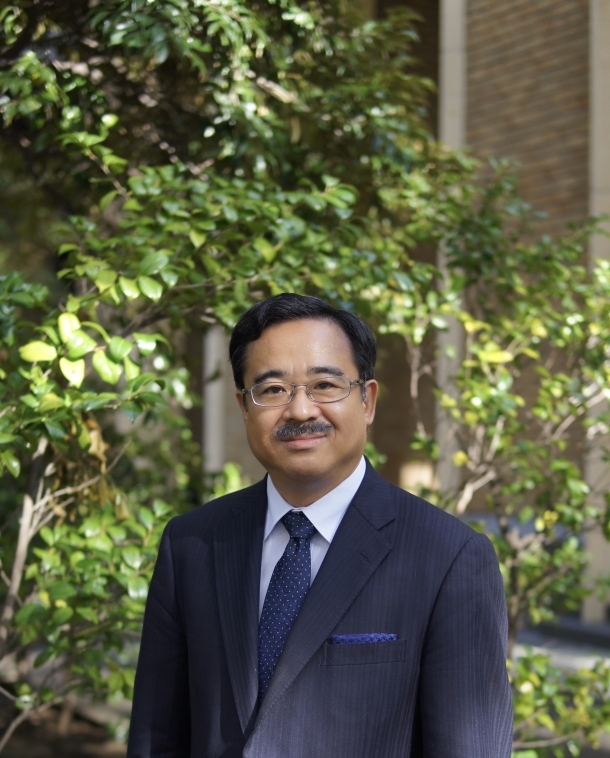 In such a way, Waseda University’s School of Law is aiming to carry out a balanced education that takes into account both legal education and language education at the undergraduate level. While maintaining this premise, the School is fulfilling its mission of educating advanced legal professionals. For students who aim to become actual legal professionals and legal researchers, we offer courses that are connected to the Graduate School of Law and the Master’s Program in Waseda LL.M., and are planning to strengthen relations in the future with both graduate schools. Lastly, I want to convey the major reason as to why the Waseda University School of Law is part of Waseda University. The study of law is considered as being the study of adults. This means that in order to truly understand law, which is applied to human beings and societies, a certain extent of social experience is necessary. Although this is difficult to be obtained from students who just graduated high school, life at Waseda University will provide opportunities, both in terms of actual experiences as well as simulated experiences, to a considerable extent. Waseda University has a library that houses an enormous collection, including books necessary for undergraduate studies, as well as books that students want to read. During the school season, there are also lectures hosted throughout the school, and there are abundant opportunities to directly hear successful people from various fields speak. Reading these books and participating in these lectures are extremely effective in broadening your horizon and expanding your world. In addition, exchanges and dialogues with fellow Waseda students who have come together from all across the country, and simply meeting them and getting to know them is a life experience. Student life and working hard with peers in seminars are valuable experiences in studying law. The School of Law at Waseda University takes the initiative in making approaches to research various issues in contemporary society, and enriched lectures by distinguished researchers and faculty members who lead their respective academic worlds are being given everyday. As such, we at Waseda University and the Waseda University School of Law believe that we can provide plenty of ways to satisfy your keen curiosity and spirit of challenge. Each one of our faculty members will not spare any effort every day to make the University more attractive. As the social climate in Japan and across the world changes drastically today, think about what you want to learn and what you want to think about, and how you should put this to use, together with the faculty members at Waseda University’s School of Law. <<https://www.waseda.jp/folaw/law/en/>> doesn't support your system.